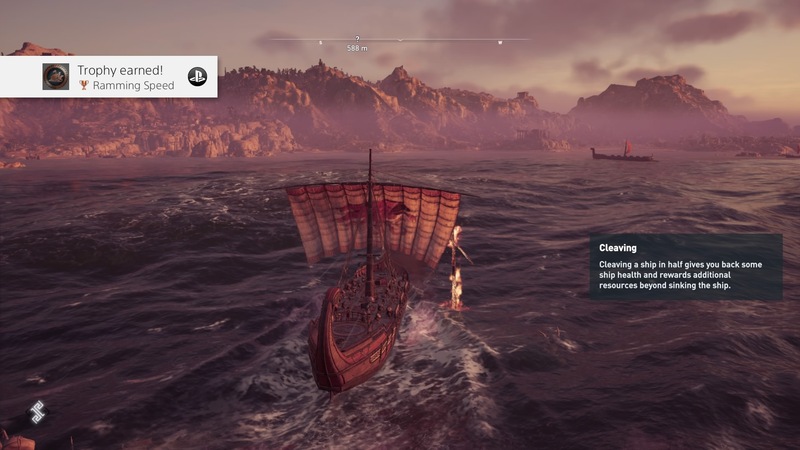 It’s hard to imagine a better demonstration of the state of AAA gaming today than Assassin’s Creed Odyssey, a game where the whole of the wine-dark Classical Aegean is available for you to ply with your oars — but which operates according to a risible, cartoonish video game logic that seems, if possible, even more anachronistic. Should you play it? Absolutely. In case you haven’t been following the Assassin’s Creed… well, odyssey, the last few years, the game took some time off following the lavishly produced but ambivalently received Unity and Syndicate games, set in revolutionary Paris and Victorian London, respectively. The series, critics said, was wearing itself a bit thin despite the fabulous set dressing. You can imagine everyone’s surprise when AC returned in Origins, set in an enormous swathe of ancient Egypt. New systems nudged the game from the stealth action of its roots toward the expansive, open-world RPG currently in vogue. It was a little rough around the edges, but the scale was welcome, as was the shift away from the increasingly turgid Assassins versus Templars secret society scramble. The news that the next game would take place in Ancient Greece at the time of the Peloponnesian War thrilled me to no end. I’ve always been a fan of the Classical era, Homer and Herodotus and Periclean Athens and all that. I’ll also admit to an unironic love of “300” and the story of Leonidas’s last stand — the graphic novel, not the movie, which was awful. Are you kidding me? Look at this. Here, then was that world brought to life with all the fidelity that Ubisoft’s hundreds of artists and modelers could bring, with a narrative combining secret societies with classical warfare, historical figures and high-seas adventure (I loved the pirate-themed AC Black Flag). On paper this is the greatest game ever to grace the screen. And in a way, it is. 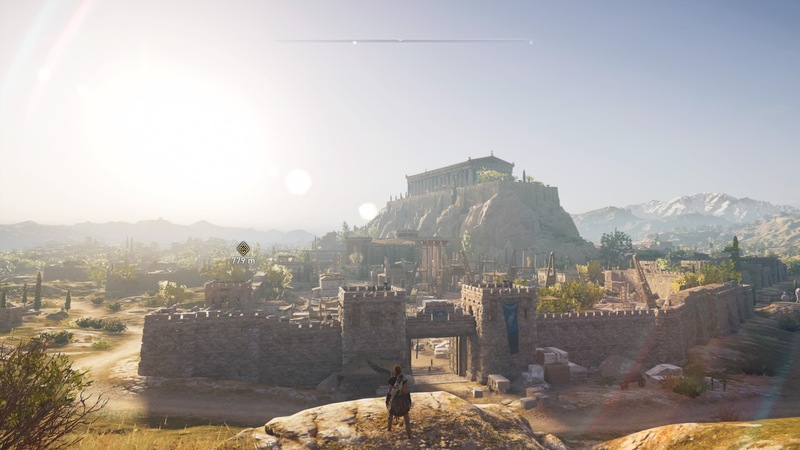 Ubisoft’s rendering of the Classical world is so beautiful, so massive, so obviously a labor of love and skill and intensive research that I have spent much of my time in the game simply gawking. The costumes! The statues! The landscapes! The light! 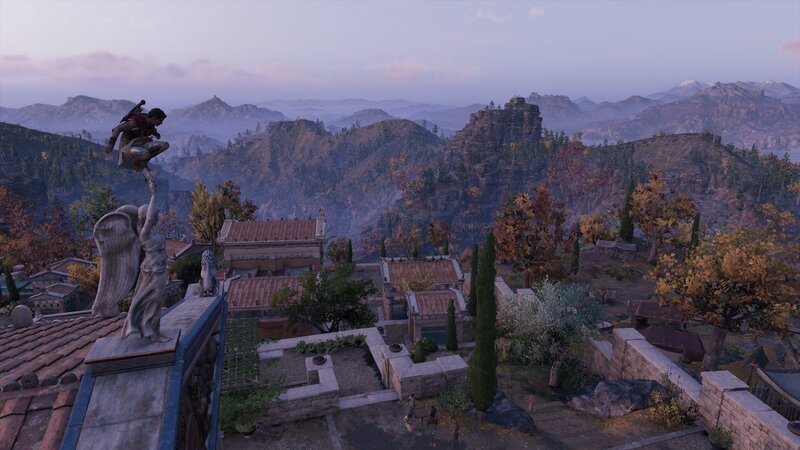 It’s a feast of details at every location, from the idyllic backwater of Kephallonia, where your hero begins their story, to the sprawling, bustling Athens just approaching the zenith of its glory. I (that is to say, my character) walked past the Theatre of Dionysus in its construction, which I have visited in person (now ruined and restored, of course), and on up to the Acropolis, where I scaled the Parthenon and looked out over the tiled roofs under one of which, for all I know, I may find Plato sitting and writing The Symposium. Then I meander to the harbor, board my black ship and split the seas to explore any of the islands in the entire Aegean — any of them. The whole Aegean! Well, most of it, anyway. Enough that you won’t ask for more. Here be mythical creatures, political machinations, stormy seas and sunny shanties. The world that Assassin’s Creed Odyssey inhabits, I feel confident in saying, is the largest and most impressive that I have encountered, with special credit given for having to reflect reality to a certain extent, which is not a limitation shared by its eminent competition in the open-world genre, like Horizon: Zero Dawn and Breath of the Wild. 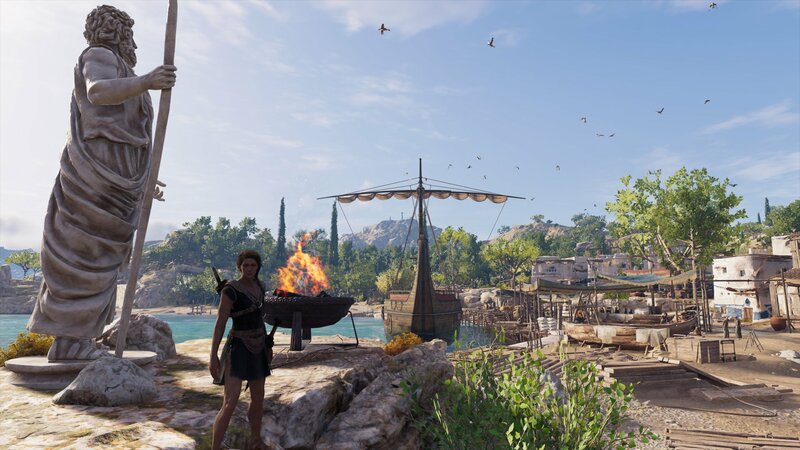 In my opinion, both as a gamer and a lover of antiquity, it is worth the price of admission to experience this world, to see and hear Ancient Greece in a way that was heretofore impossible, and simply to revel in the almost inconceivable level of craft that was so obviously put into this mind-boggling world. And now, having made that judgment, I will proceed to trash the game I just recommended for about two thousand words. 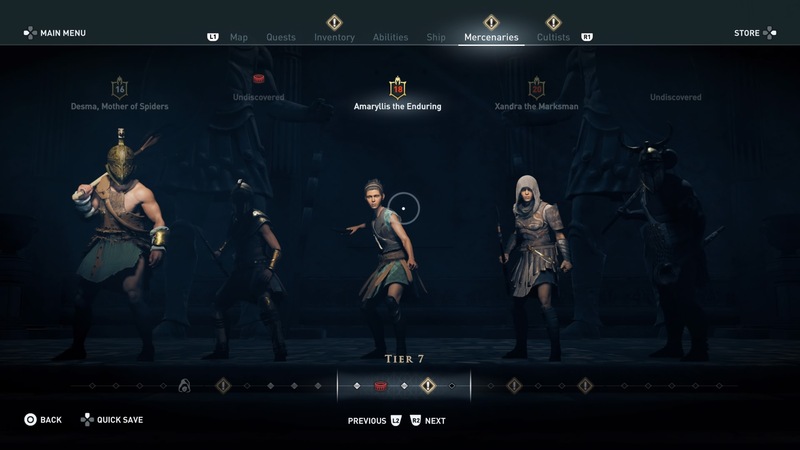 Assassin’s Creed Odyssey, the game itself, is embarrassing to play. The characters you interact with and the minute-by-minute gameplay are so uneven that I truly believe that Ubisoft simply didn’t have time to adequately play-test it. It feels like the game was just too big to run through once they’d made it so they just shipped. If someone from Ubisoft were sitting next to me as I played, I would expect them to be cringing constantly. It’s an incredibly lopsided collection of old and new ideas, balanced and unbalanced systems, good and bad UI, intuitive and baffling combat, beautiful and repulsive graphics, and excellent and laughable voice acting. I haven’t finished the game, let alone all the side quests, but although I expect to encounter more good things as I go, the bad things were apparent pretty much from the first few minutes and haven’t abated. The AI of the people in this game seems to have regressed 10 years to a simpler age. They are truly idiots all, from people on the street to elite soldiers. Good old Adrastos the Logician, engaging in hand to hand combat. One of the first things that happened when I got my horse and learned to have it follow a road was that it mowed down a few laborers. This, I found, would happen everywhere I went: every character in the game walks right in the center of the road and dives madly out of your way as you canter down it, screaming and cursing. Wild animals cluttered the road, and reacted confusedly as I approached, throwing themselves under the hooves of my steed, Phobos. This was my first taste of what would become a theme. Why, I asked myself, wouldn’t these people just walk on the side of the road? The developers clearly accounted for horses riding down it, and have behaviors and barks for when that happens. But it’s so weird, so unrealistic, so video gamey. Surely in this lovingly rendered world it is not unusual for a horse to run down a mountain road? Why then do they behave in this way? Because the people were not created intelligently — it’s as simple as that. None of them. I once emptied a military camp of guards and then set about looting the place. A woman was being held captive in a cage — not an uncommon thing to find — so I let her out. As she escaped, thanking me, I turned to take the items out of a nearby chest. The woman, mid-escape, screamed with rage at me for this theft, snatching a nearby spear and rushed me in righteous anger. What? Perhaps I can’t expect every peasant to be a genius, but guards too (of all ranks) are unbelievably dense. They will step over the corpses of their fellow men to get to their post and not say a word. They will fail to hear the clashing of swords, or not notice a guy being violently flipped over and disemboweled, a matter of feet away. They will follow you one by one around corners where you can dispatch them individually and fail to see or care about the ever-widening pool of blood. They are as dumb as the dumbest guards from games that came out 10 years ago. Not much better are the much-ballyhooed mercenaries, who come after you if you do too many bad things. It’s not really clear what the bad things are, but eventually you’ll see a red helmet icon on your map and know you’ve been naughty. They’re basically guards with special weapons and a few characteristics like “weak to fire” or “takes 20 percent less ranged damage.” Technically they have backstories but you have to drill down to their description to find them, and by the time you’re doing that you’ve probably already killed them. You can recruit them for your ship, like you can recruit anyone, but they generally amount to stat bonuses with funny names like Demos the Drunk. He didn’t act drunk — just had a spear I wanted, so I took him out. I mean, the variation is welcome, but it’s nothing like, for example, the nemesis system in the Mordor series. Combat is a real mix. You are no longer a fragile assassin who can be killed from a few good hits, but a powerful warrior with supernatural skills like instant mid-battle heals and teleportation. This is combat between equals, but your equals are generally stiff types with two or three attacks they repeat over and over, glowing a bright red or gold before doing so. A slippery-feeling dodge system zips you through these attacks, or you can parry some of them, then slash away at your attacker. Some guards or targets, especially if they’re a level or two above you, will take minutes of patient slashing before they drop. I was sent on a hunt to kill a legendary boar that I gave up on after a couple minutes because I had only taken its health down by a quarter while not being hit myself. Compared with other action RPGs it’s pretty listless stuff. More appealing is the stealth, which the fools of guards are obviously there to encourage, since you can empty a camp or fort of its occupants systematically and it can be quite satisfying. But with the perfect knowledge effected by scouting such a place with your eagle’s x-ray vision, it feels more like bullying than anything. The Peloponnesian War is going on around you, though you’d be hard-pressed to notice most of the time. You don’t exactly take sides, since whatever area you’re in, your enemies are the ones in control. You can weaken the faction in power by various means and force a battle (a melee in which the combat, now against dozens, feels frustratingly sloppy), but ultimately the guards and camps feel much the same as one another — Spartans have different helmets from Athenians. I thought at first this would be deeper than it is. I had looted a variety of armor pieces, several of which suggested I could use them to blend in among the Athenians whom I was at that moment working to undermine. So I donned them and headed to the nearest camp, hoping to walk about unsuspected, Hitman-style, sowing chaos by releasing caged animals and setting fire to supplies. Nope: I was immediately attacked on approaching the gate, before I’d even come in or done anything suspicious. The guard that had never seen me before apparently recognized me as the bloodthirsty mercenary who’d wiped out a camp a mile or so away, minutes earlier. No espionage for me. It’s never really clear who you’re fighting or why, because the locations and people are just names. It doesn’t matter if they’re Athenian or Spartan, just that they’re the ones between you and the treasure chest. I guess that’s the life of a mercenary, but it doesn’t make you care a lot. The RPG elements, from gear to abilities, have almost no integration with the game itself. From the very beginning you can see your whole skill tree, including things involving the magic spear that you don’t yet know is magic. You gain new abilities and upgrade your ship not through interesting quests or meeting interesting people, but simply by spending points and resources. When your ship’s captain says the hull ought to be upgraded, it’s not the start of a quest to find some cool big trees or visit his hometown where he left his ship-building tools and pals. It’s literally just a reminder to stock up on wood and iron and press the button to upgrade in the pause screen. When you meet a talented carpenter whose brother is being held by bandits, it isn’t a quest to reunite these guys for a power team that enables a ship repair superpower. He just turns out to be a regular guy who increases your hull strength by a couple of percentage points. Quests, talked up ahead of release as being fully voiced and emergent, as though you’re receiving a request for help from a needy merchant or the like, are nothing of the sort. Every one I’ve encountered so far has been a variant of: Kill these five wolves specifically. Kill these three Spartan elite guards specifically. Kill these bandits. Sink these ships. Each has a flimsy justification (they’re blocking the road; they stole money from me) and are often atrociously acted. In one I found the quest giver asleep; he obligingly woke up to say he wanted to take the fight to some bandits who had been demanding money from him. As soon as I agreed, those very bandits materialized not 10 feet away and instantly ran him through. Quest failed. There are deeper side quests, to be sure. But the hundreds of quests you’ll see on quest boards or appearing randomly in the wild are like this, and rarely give more than a spritz of XP and gold. Sometimes you can recruit the quest-giver, though they might or might not be helpful on your crew. I wish that they had taken the time and effort that went into creating 20 or 30 of these quests and made one single side quest with multiple steps, characters that mattered a bit, and provided substantial rewards like a new ability for your ship. Even main story quests, such as the targets you’ll be taking on, can be disappointingly shallow. You’re supposed to be following threads and clues, but several are just handed to you: Here’s some lady. Here’s her exact location. Go kill her. No dialogue, no footwork, no alternatives. Stab this person and take their shiny thing. Isn’t there a conspiracy or something? Shouldn’t I at least try to get some information out of her? Why isn’t there even a death cut scene like in so many of the other games? The writing is hit and miss. The main story and its immediate side quests are fine — I’m perhaps 25 hours in and I’m interested to see where it’s going, even if it’s not particularly surprising. And it helps that the writing and voices for the main characters are leaps and bounds above the rest. 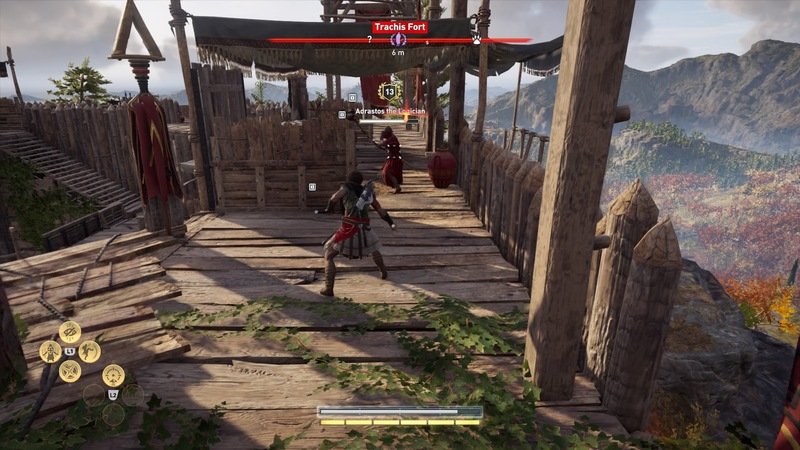 I chose to play as Kassandra, as opposed to Alexios, for a lot of reasons. And I love her. She’s well-acted, her writing is funny and occasionally realistic, and I like that she is indistinguishable from her male alternative in every way. Your companions, especially Herodotos and your exuberant captain Barnabas, are great. Yet other characters are ridiculous: badly written, worse acted. Even major ones. I remember one exchange with a soon-to-be-target who was pressuring me to torture some poor sap. His voice acting was so bad, especially compared to his interlocutor Kassandra’s, that I was laughing out loud. He was far from the only example of this. Games like The Witcher 3 have spoiled us on the quality of the writing and quests, but that should be a new bar to meet, not a high-water point. It’s sad that Ubisoft hasn’t upped its game here, so to speak; it feels like 90 percent of the game I’ve played so far is purely mechanical, and even at its best it sits like a layer of butter spread thinly across an enormous Greek piece of toast. But what toast! It’s tantalizing to see how good a game like this could be, only to be let down again and again with elements that would feel out of date 10 years ago. I’m having a great time when I’m not shaking my head at it, and enjoying the scenery when I’m not being attacked by one of the evidently 50,000 bears out for my blood in the Classical world. As I wrote earlier, to me it is worth buying just for the good parts. But as someone who cares about games and loves the idea of this one, I can’t help but observe how dated and baffling it is at the same time. It doesn’t live up to the world it was created to inhabit, but that world is practically a complete game in itself, and one that I immediately loved.